Nashville Predators general manager David Poile has tried his to get his team deep into the postseason, and it's come at a steep price. For a second straight year, Poile did not have a first-round pick at the NHL Draft; he dealt it to the Buffalo Sabres in February to land gritty center Paul Gaustad. However, that doesn't mean the Predators are void of prospects or solid young players. The club recently re-signed center Colin Wilson -- its first-round choice in 2008 -- to a new three-year deal. 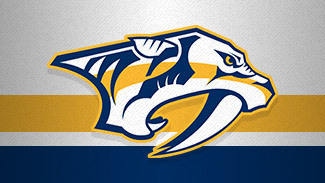 From June 26-July 1, the Preds held their annual development camp, where all nine of their 2012 draft choices participated, including left wing Pontus Aberg, Nashville's second-round choice and the 37th player taken. "He plays a two-way game, but looking at him he is probably more offensive than anything," Predators European scout Lucas Bergman told the team's website. "He has one-on-one ability, he can challenge the defense, he gets pucks off of his stick quick and all of those things are very attractive." 1. Mattias Ekholm, D: One year after earning Rookie of the Year honors in Sweden, Ekholm has Nashville brass gushing after he had nine goals and eight assists in 41 games for Brynas and won the Borje Salming Award as the SEL's top defenseman in 2011-12. He brings size (6-foot-4, 200 pounds) and skill to the table and will undoubtedly vie for a spot on the big club this fall. Ekholm was Nashville's fourth-round selection (No. 102) in 2009. 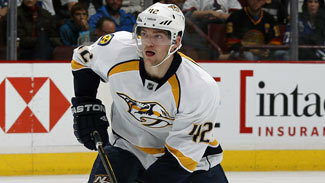 "I can't wait to get him over here and get into our system and play in North America," Poile told The Tennessean. "I know he's going to be a good NHL player in time." 2. Magnus Hellberg, G: Nashville's second-round choice (No. 38) in 2011 is preparing for his first season in North America after enjoying a solid season with Frolunda in the Swedish Elite League. In 17 appearances, the 6-foot-5 goaltender boasted a 2.60 goals-against average and .904 save percentage with two shutouts. He also played with Frolunda's junior team and Orebro of Sweden's second league (Allsvenskan) last season and led all juniors and ranked second among all Allsvenskan netminders in save percentage (.936) and GAA (2.04). Hellberg signed an entry-level deal in June and is expected to play with Milwaukee of the American Hockey League in 2012-13. 3. Austin Watson, RW: The Predators haven't had many first-round picks in recent years, but they used the 18th selection at the 2010 NHL Draft to select this 6-foot-3 center from Ann Arbor, Mich. Watson, 20, split the 2011-12 season between Peterborough and London in the Ontario Hockey League and combined for 25 goals and 43 assists in 61 contests. He also went 10-7-17 in 19 playoff games for London and became the first U.S.-born player to be named OHL Playoff MVP. 4. Zach Budish, RW: The big power forward (6-foot-3, 220 pounds) is coming off an impressive junior season with the University of Minnesota, where he tallied 35 points (12 goals, 23 assists) in 43 games. The biggest worry for the Preds when it comes to their second-round pick (No. 41) from 2009 is that Budish has already had two surgeries to repair torn ACLs. 5. Pontus Aberg, LW: Aberg will likely spend at least the next two seasons in Sweden, but the Preds are high on their second-round pick from the draft in June. A solid competitor with good hands, the Preds are hoping Aberg can develop into a top-six forward. He had eight goals and 15 points in 47 games for Djurgarden last season before being slowed by injuries. 6. Garrett Noonan, D: Nashville's fourth-round pick (No. 112) from 2011 progressed tremendously in his sophomore season with Boston University -- he tallied 16 goals and added 11 assists in 38 games. The 6-foot-1, 200-pound blueliner will return to BU for 2012-13. 7. Taylor Beck, LW: Another power forward (6-foot-2, 206 pounds) who put up solid numbers in his first season as a pro. In 74 games for Milwaukee last season, the Preds' third-round pick (No. 70) from 2009 had 16 goals, 24 assists and 32 penalty minutes. 8. Josh Shalla, LW: The high-scoring wing was Nashville's fourth-round pick (No. 94) in 2011 and signed an entry-level deal with the club in April after tallying 76 points (40 goals, 36 assists) in 53 games for Saginaw of the Ontario Hockey League. The 6-foot-2, 203-pounder will more than likely begin his pro career with Milwaukee in the AHL this fall. 9. Charles-Olivier Roussel, D: Appeared in the Memorial Cup for the Saint John Sea Dogs (Quebec Major Junior Hockey League) and had 15 points in 17 playoff games after 13 goals and 40 points during the regular season. Nashville's second-round pick (No. 42) from 2009 plays a physical game and has offensive upside. 10. Colton Sissons, C: The Predators had two second-round picks at this year's draft, and used the second one on this 18-year-old winger. In 58 games for the Kelowna Rockets of the Western Hockey League last season, Sissons had 26 goals and 15 assists. Nashville's staff has compared his game to current Preds center Craig Smith.